[toc]Acid reflux is also known as acidity or gastro esophageal reflux disease (GERD). It is very common to feel burning sensation in our food pipe after a heavy meal. But if these symptoms occur even after the intake of normal meals, one is known to be suffering from acid reflux. 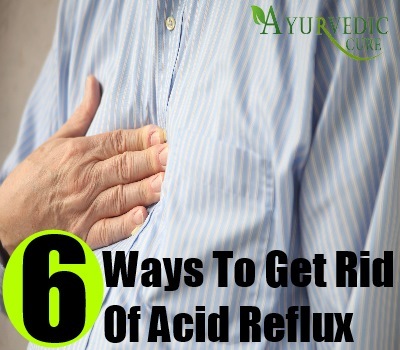 One can get rid of acid reflux by using medicines, surgery, diet control and lifestyle modifications. All the pharmacies or drug stores keep over-the-counter acidity-relieving medicines. As soon as the symptoms start revealing themselves, the first thing to do is to control the diet and modify your lifestyle. 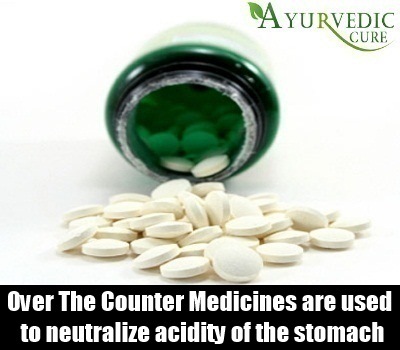 Over-the-counter medicines help in relieving mild to moderate symptoms of acidity. Antacids like Gelusil and Eno are commonly used to neutralize acidity of the stomach. Though these are over-the-counter medicines, you should consult your doctor or pharmacist. The antacids may interfere with some other medicines that you may be taking. There are another type of antacids which are called Alginates, which work slightly differently. They protect the inner lining of the stomach and esophagus by giving a protective coating. You doctor may prescribe proton pump inhibitors, in case you are not responding to antacids. Proton pump inhibitors reduce the production of acid in your stomach. It is important that your doctor gives you the right kind of dose to minimize the side effects like diarrhea, constipation, rashes or dizziness. The other medicines that can be prescribed to you are prokinetics. Prokinetics help you in decreasing the irritation of your esophagus. If your doctor is not able to treat you with the above mentioned medicines, he is left with only one option and that is surgery. Sometimes the patients opt for surgery just due to the fact that they have been taking medicines for too long and want a permanent solution without the nasty medicines. Usually surgery helps in giving relief from acidity, but it may cause certain other complications like flatulence, bloating and difficulty in swallowing. There are many surgical procedures available for the treatment of acidity. They are: endoscopic radiofrequency ablation, endoscopic augmentation with hydrogel implants, endoscopic injection of bulking agents, endoluminal gastroplication and laparoscopic nissen fundoplication. The most common of these surgeries is laparoscopic nissen fundoplication. Taking care of what you eat, when you eat and how much you eat. Taking care of all these can go a long way in treating your nagging acidity. There are some foods which produce acid in the stomach. They need to be either totally eliminated or reduced. Spices, greasy foods and deep fried food items are known to create acidity. Yogurt is a natural food that is inexpensive, yet very effective. Natural probiotics are well known to help in acid reflux. 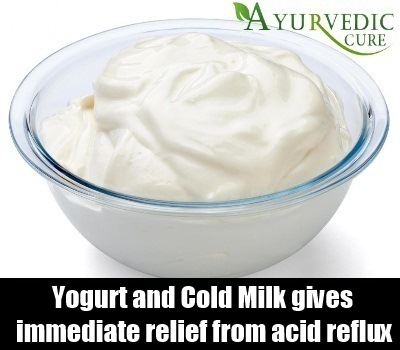 Cold milk or milk at room temperature gets immediate relief from acid reflux. If you are a patient of acidity, you must eat smaller portions frequently. This helps your digestive system to work efficiently, thus reducing the buildup of acid. Allow gravity to assist your digestive system by sitting for a long time after you have had your meals. Thus, if you’re suffering from acidity, eat your dinner at least two hours before your bedtime. Acid reflux can happen due to obesity. If you lose the excessive weight, it is likely to give you relief from acidity. Smoking is another cause of buildup of acidity. Smoking doesn’t let your digestive system work properly and is likely to damage the lining of your elementary canal. 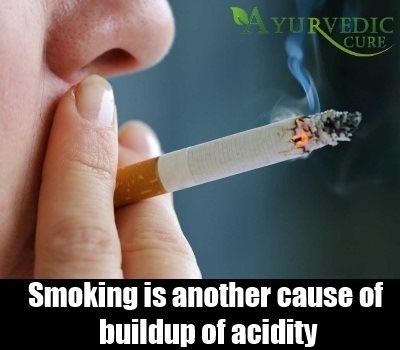 It is advisable that you quit smoking altogether if you are looking for a relief from acidity. Medical science gives a very convincing link between acidity and stress. We need to understand a bit of physiology to be able to appreciate this link, thereby manage our stress effectively. As you eat, food should travel down and not move up. Nature has provided a mechanism to control this movement. There are two valves or call them sphincters meant to control this movement. One of them is the oesophageal sphincter and the other one is the pyloric valve. Both are located at the front and the rear of the stomach. They regulate the food incoming and outgoing in the stomach. When there is stress, the pyloric valve becomes tight, thus preventing the food to pass to move ahead. Simultaneously, the oesophageal sphincter becomes relaxed causing the food to move backwards into the food pipe. Infections caused by Helicobacter pylori may result in acid reflux. Some doctors rule out the infection caused by the said bacteria while treating a patient for acid reflux. Though some other medical practitioners find this to be controversial.